Hamish Brown was the first walker and climber to complete the Munros in a single round. By his own rules he did it self-powered except where ferries were required and with the aid of his trusty fold away bike. The year was 1974, and the roads of Scotland carried only a fraction of the traffic they do today, windmill farms were unheard of, crafting was more vibrant than it is today, and a strong Scottish mountaineering tradition was already established. 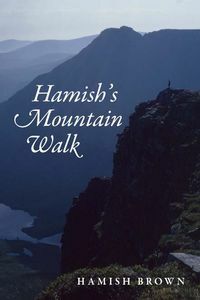 Four years later Hamish s Mountain Walk appeared and was an immediate success, inspiring not only climbers but also readers fascinated by the history, geology, plant life and lore of one of Europe s most remote and unspoiled regions. Many walkers and authors would follow in Hamish Brown s boot prints, but none could bring the freshness and few could touch the depth of knowledge and experience. Now the book returns, re-imagined in modern fonts, with a new introduction and appendix and with two brilliant full colour plate sections.